What Are the Different Pagan Religions? Wicca is only one of many paths. For most outsiders, “Pagan” is a single religion. It is also normally seen as being synonymous with Wicca. The reality of Neopaganism is very different from this simplistic view. Neopagan traditions tend to be very different from each other. While most Pagan paths are polytheistic and see the earth as sacred, the details vary wildly between traditions. Frankly, the details of what exactly each religion is varies within each tradition. This is in part because Pagans do not have a strictly set doctrine like Christianity or Judaism. Pagans traditions tend to have general guidelines, but there is no such thing as an “orthodox Druid” or a “heretic Witch.” That does not mean, however, that there are not common beliefs held by most people in a Pagan religion or ideas that define where one tradition ends and another begins. There are many different Pagan religions and many more variants of each. There are, however, some traditions that tend to come up in conversation more than others, and based on either their size, visibility or publicity, have become more well-known in non-Pagan circles. Wicca is probably the best known Pagan religion and probably the most misunderstood. Many Wiccans refer to themselves as Witches which has led non-Pagans to equate magick and witchcraft with Wicca, although many other Pagan traditions practice them. Wicca is known for worshiping a God and Goddess. Who this God and Goddess are varies from Wiccan to Wiccan. Some choose two deities from another pantheon, such as the Celtic goddess Brighid or the Greek god Poseidon. Others choose to honor deities that have become more heavily associated with Wicca, such as the Horned God and Triple Moon Goddess. Some Wiccans also choose to worship figures from other religions for their deity pair, such as Kali and Shiva or Jesus Christ and Mary Magdalene. Druidry or Druidism is a Pagan religion that seeks to the “greatest yearnings” of humanity. The Order of Bards, Ovates and Druids, a worldwide group dedicated to Druidry, defines these yearnings as the desire to be “fully creative in our lives, to commune deeply with the world of Nature, and to gain access to a source of profound wisdom.” Thus, the three goals of Druidry are wisdom, creativity and love. Like other Pagan traditions, Druidry has no real set dogma or sacred text. Unlike Wicca which focuses on a God and Goddess, Druids run the gamut from monotheistic to polytheistic to those who believe that Deity is by its very nature unknowable. Given the many different views that will be found among Druids, Druids tend to put a high focus on tolerance of diversity. Regardless of how Deity is defined, nature is held by Druids to be sacred. Most Druids also believe in the Otherworld, the place that souls go after they die. Many, but not all, Druids believe that souls spend some time in the Otherworld before they are reincarnated back into this world. Asatru is a Pagan tradition based on old Norse beliefs. Also called Heathenism, Asatruans believe in the Norse pantheon that includes Odin, Loki, Freya and Thor and follow a set of guidelines known as the Nine Noble Virtues. These virtues are courage, truth, honor, fidelity, discipline, hospitality, industriousness, self-reliance and perseverance. Asatru is unusual among Pagan religions in how much it focuses on history. Druidry and pantheon based Pagan paths have roots in ancient traditions, but most scholars agree that modern Paganism rarely has much in common with its ancient roots. Heathenism, however, works to be as similar to the old Norse religion as possible while adapting the religion to a more civilized age. 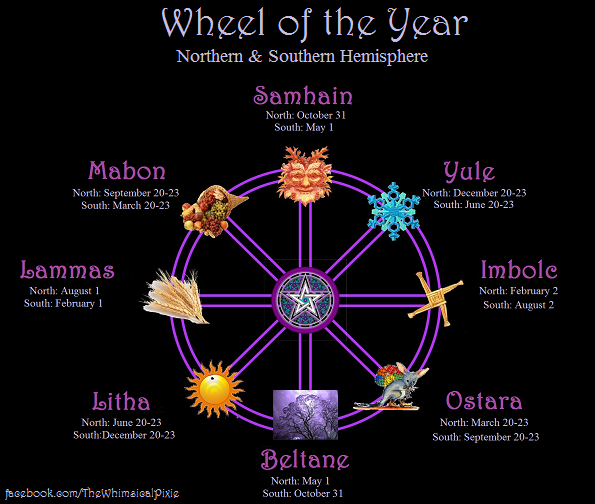 Pantheon based Paganism is a catch all term for the various Pagan traditions that are centered around a specific pantheon rather than a set of guidelines. Asatru, given its emphasis on the Norse pantheon, could technically be considered a variant of pantheon based paganism, but the guidelines and organization within Heathenism set it slightly apart from many pantheon based paths. Pantheon based Paganism is exactly what it sounds like. It is Pagan religions that are centered on a specific ancient pantheon, such as the Greek pantheon or the Celtic pantheon. These religions are generally less well defined than more organized and commonly recognized traditions such as Wicca and Asatru. Eclectic Paganism is exactly what it sounds like. It is a Pagan path that pulls from a variety of traditions. They may worship Odin and Hera but use Celtic rituals. They might also observe a unified pantheon or follow the guidelines of another Pagan tradition but create their own, unique, individual rituals and practices. Eclectic Paganism is difficult to define even by Pagan insiders because there is no official dogma in Paganism. As such, the lines between traditions blur which makes it hard to decide who is pulling from multiple traditions. Pagan religions are difficult to define because there is no set doctrine that states “this is what it means to be a Druid.” Instead, Pagans are left to figure out for themselves what it means to be Wiccan or Eclectic. Much to the frustration of curious outsiders, defining Pagan traditions is often an individual matter and a sense of feeling. A Wiccan may not have a perfect definition of Wicca, but they know their faith well enough to look at something and say “that is not Wiccan” or to feel the energy of another person’s ritual and know that they are looking at a Wiccan sister.